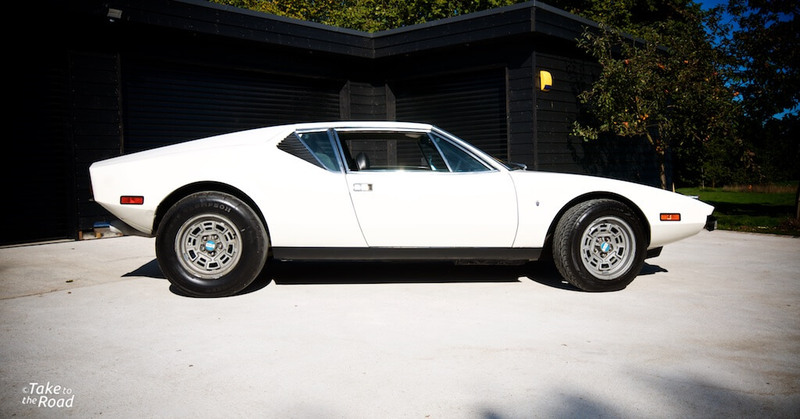 For me the De Tomaso Pantera is one of the ultimate super cars from the 1970s. It offers a driving experience that is rather different when compared to its other Italian rivals of the era. And it just looks and sounds amazing. It is a very simple statement to make but that, I feel, sums up the Pantera. As is normal for most petrolheads, I have a top ten list of cars that I want to own and drive one day. 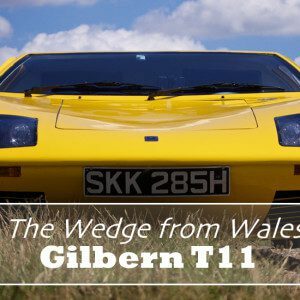 The De Tomaso Pantera has been on that list for some time so you can imagine the excitement when I was offered the chance to drive one. The side profile really highlights Tom Tjaarda’s wedge design. It is all angles but they go together so well. This particular 1972, matching numbers Pantera had just arrived in from America. The owner had sourced it from the dry state of Utah so the body was in excellent shape and looked virtually rust free. Rust is a big enemy of the Pantera. They were not built with much care or attention and when they do rust, they are costly to put right. But this one was very straight. At a distance the white paint looked nice but on closer inspection it showed up lots of little marks and imperfections. The car was originally blue but had been resprayed badly in the States, so the owner is planning a full strip down and respray in Ford Mustang Argent Blue. Inside the interior is all original and has held up well though the steering wheel needed restoring. 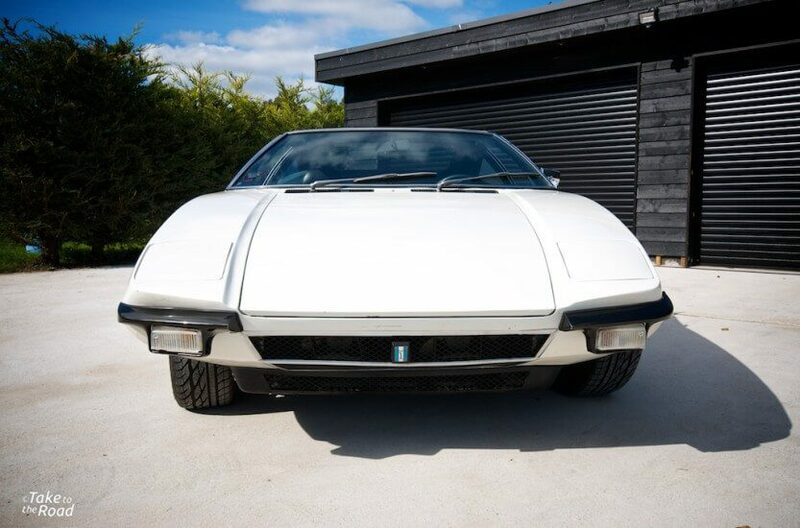 So this De Tomaso Pantera is best described as a really good useable driver. The front end is very sharp and the thin eyebrow bumpers keep it clean and simple. When I first laid eyes on the white Pantera, I was amazed at how clean and compact it looked. Like with many contemporary wedge concepts of the era, designer Tom Tjaarda produced a wonderfully simple and uncluttered design. It looks just as good today as it did in the 1970s. And as this example is from 1972, it retains a certain purity. The low wedge front end and its thin bumpers give it a sharp aggressive stance. It looked like it was cutting through the air just sitting there. 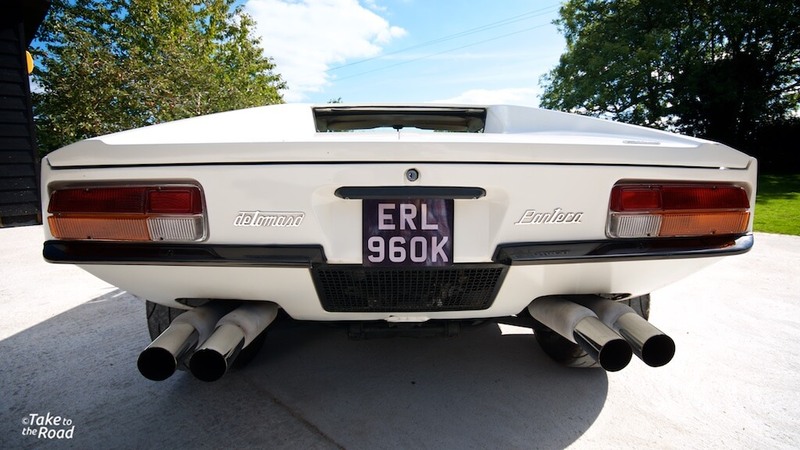 The back end of the Pantera is mean. Very mean. Just look at those tyres and exhausts! Walking round the car your eye is immediately drawn to the business end. The rear sits quite high, exposing the large tyres and showing off its impressive quad exhaust system. If ever there was a statement of intent, this was it. The exhaust is actually a Hall Pantera big bore system with Hall big bore headers, an upgrade over the standard, more restrictive factory system. Ceramic coated as well to help reduce heat soakage. Under the large engine cover sits the mid mounted Ford Cleveland 351 5.8ltr V8. And on top of the engine sits a Holley 4 Barrel carburettor. I knew I was in for a treat. As for the rest of the engine, the owner isn’t sure what has been done so it is a bit of an unknown entity. It could have anything from 320BHP to 400BHP. Or more. Cue excited and slightly nervous laughing! Powered indeed by the impressive Ford 351 Cleveland V8. Firing up the 5.8ltr V8 monster was exciting. 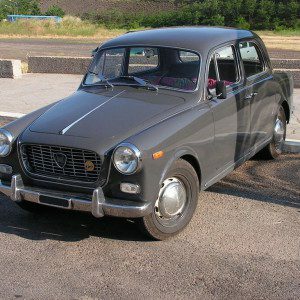 Initially the starter motor laboured as if it didn’t want to turn but then the beast roared into life, shaking the whole car before settling down into a low rumbling idle. It was music to the ears, but the best was yet to come. As I got comfortable in the seat I was amazed at how much of the front wheel tub intruded into the footwell. As a result the pedals are pushed far to the right, which puts the throttle very close to the centre console side panel. This is not a car for big hobnailed boots! Despite that there is plenty of leg room in the Pantera. 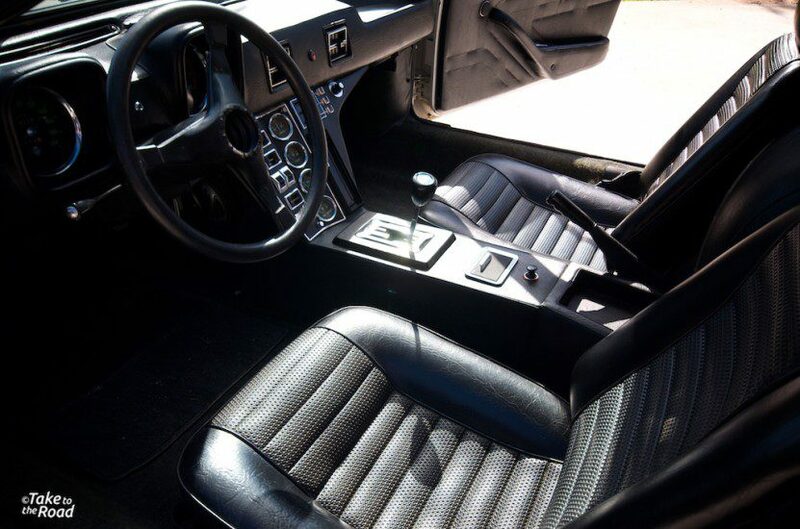 The interior is nice and is well equipped for a car from the 1970s. The steering wheel needs tidying though. Familiarising myself with the gearbox I realised it was a dog leg, meaning 1st was at the bottom with reverse at the top left. As I had jumped from a RHD and straight into a LHD, it did take me time to get used to the dog leg 5 speed transmission, which explains why I was constantly looking down as I changed gear. I found the gearbox heavy but satisfying to use, making a nice metallic clicking noise as it moved through the gates. The clutch did require a good push and was quite heavy but I got used to it as the drive went on. The power house that is the Ford V8. Very reliable and quite tuneable too. The engine sits very far forward with the gearbox pointing backwards. As I drove the car and went through the gears, I was impressed with the throttle response. It was instant. When I buried it the car lurched forward with breathtaking acceleration. It was brutal, scary, exciting, dramatic and adrenaline enduring, all at the same time. The roar from just behind my head was exhilarating and only encouraged me to bury the throttle more. It was intoxicating. The steering felt light, precise and controlled, adding to the balanced feeling that the Pantera was giving me. 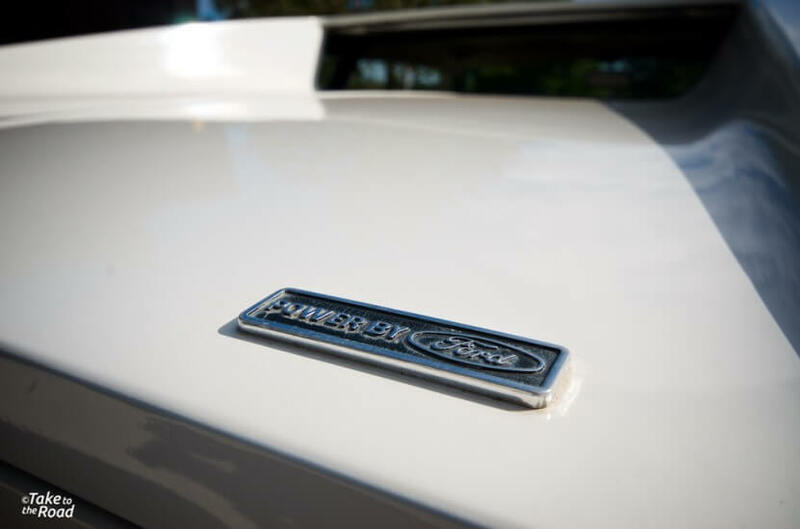 Thanks to the bags of torque on offer, the Ford V8 allowed me to drive the car aggressively, or to just stick it in top gear and cruise around. There were times I didn’t have to bother changing gear going round bends or up hills. It just pulled and pulled without fuss or complaint. But then not changing gear meant not being able to blip the throttle and hear the carbs pop and the exhaust crackle on the over run. It was a very satisfying noise. And noise is what this car is all about. Driving the Pantera is an occasion every time. You feel like you are driving thunder itself. It sounds a ridiculous thing to say but that is what I remember feeling at the time. 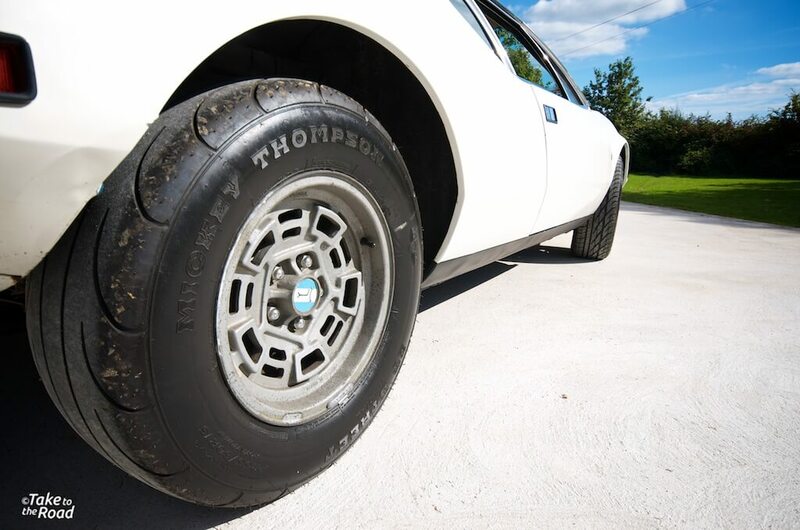 The Mickey Thompson tyres are huge and look impressive but don’t give much grip when pushed to the limit. On the twisty back roads the Pantera handled really well. It felt planted and allowed me the confidence to push into the corners. The brakes were a little soft and despite being power assisted, they needed a good shove. Which did prevent me from pushing even harder. I also found on occasion that the backend felt a little light and skittish on fast corners. This was down to the Mickey Thompson tyres which are part slick. Good on the drag strip/street circuit but not so good on atypical twisty British back roads. Despite that the Pantera felt really good to drive. Looking good from all angles. It has such presence when sat. The more I drove the De Tomaso Pantera the more I fell in love with it. I really did feel like I could keep driving it all day. Yes the cabin was hot and there was zero refinement. And because I was having to concentrate so much because of all the power on tap, it was a little tiring. But I didn’t really care. All I wanted to do was keep burying that throttle and hearing that V8 roar. Spending more time in the cabin, I found the seats ok. They were comfortable but didn’t offer enough bolster support. While the seat belts were ok (and a little fiddly to use), a racing harness would do better of keeping you in your seat when you chuck it round a corner. I also found that the speedo and rev counter gauges were buried too deep into the dashboard. Later models did away with the deep set twin binnacle arrangement and I can see why. With such an involving drive and so much going on around me, I did find keeping an eye on the gauges a little hard. Another oddity of the Pantera design is the fact that the fuel filler is located in the engine bay, so you have to open the engine cover to access it. I can understand Tjaarda’s desire for clean and uniform panels but not having an externally accessible fuel cap is a bit annoying. And as this car is just a little bit thirsty, you’ll be spending as much time at the petrol station as you do on the road. But this is an old super car after all so you can expect quirks like this. What a car the De Tomaso Pantera is. Loved every minute with it. 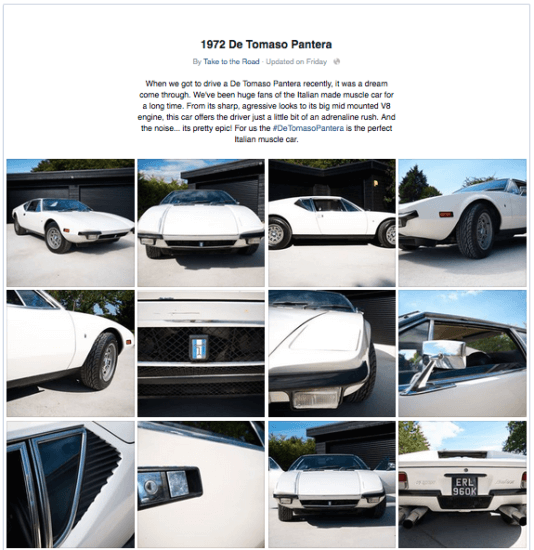 Despite these niggles, I found the Pantera brilliant. Driving such a wonderful looking car with an awesome soundtrack was a real treat. They say you shouldn’t drive your pin up cars as they will let you down. 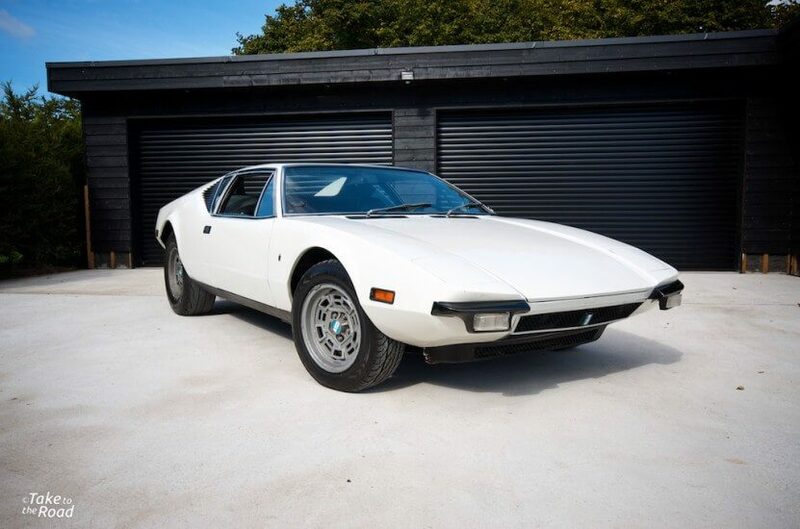 But the De Tomaso Pantera didn’t. It lived up to my expectations and then some. The fact that my test drive was the first proper shake down for the Pantera on its arrival from the States, really showed how good this car is. And its V8 engine, well it certainly felt like it had more than 380BHP. So is the Pantera still one of my top ten classic cars and do I still want to own one? Oh yes! Without a doubt. 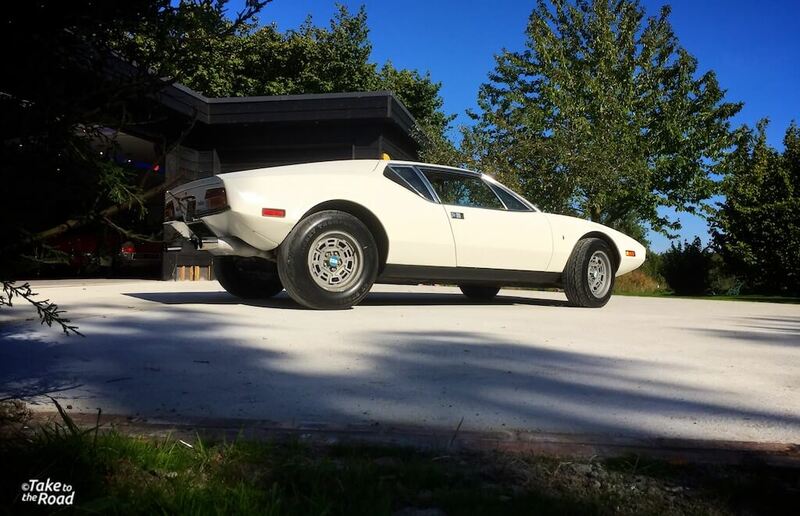 As the owner of a ’72 Pantera, I think your description of the driving experience is the best, most spot on of any ot the thousands I have read. I am getting mine back from a nearly 4 year restoration, this afternoon, and I can barely contain myself. The interesting part is I took it in to address all of the minor shortcomings that you highlighted during your drive. I found that I just wasn’t driving my Pantera at all (in light of the fact that I had a 600hp 5.0L Jaguar XKR as my daily driver, where I didn’t have to worry about any of the Pantera issues and could still be a hooligan.} So my restoration was aimed at making it a better automobile to drive. 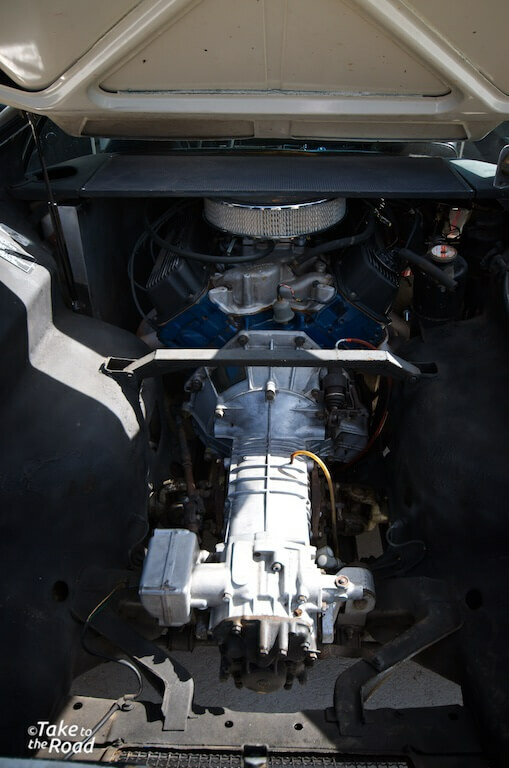 Gone is the carb in favor of fuel injection, a new 351C built engine with over 500hp/550ft/lbs, complete leather interior including boltstered Corvette seats and leather dash, hi flow cooling fans along with a previously installed aluminum radiator to help reduce the chances of overheating. A tightening and tidying up of the suspension along with big bore headers and new mufflers, and I’m in for a treat. If you ever find yourself in Southern California, let me know, and you’re welcome to take my Cat out for a day through some of the local canyons. I guarantee you’ll have fun!